Life got a little busy after my last post. 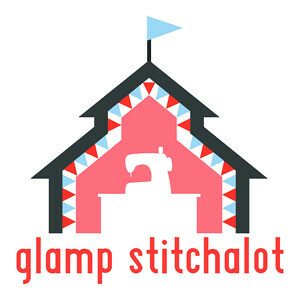 Immediately after the fall retreat was Glamp Stitchalot, and that was pretty damn cool. Picture overload ahead (you’ve been warned). 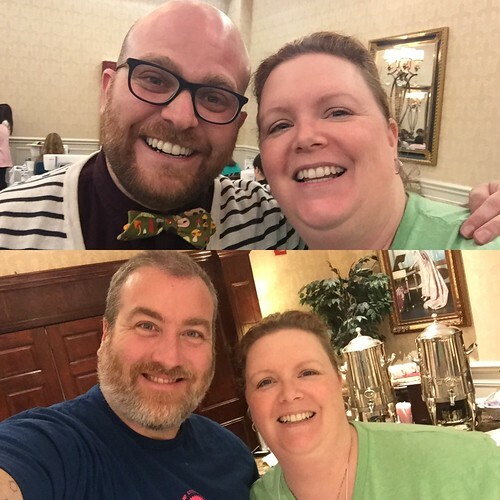 And me and the quilting dudes – Giuseppe, AKA Giucy Giuce and John Adams AKA Quilt Dad. Eventually I’ll get back at it and finish them all. The only one I haven’t started yet is Sarah’s needle turn applique. I wasn’t in the right head space for it at Glamp, but I’ll give it a go soon. What was even more fun than meeting the instructors and learning their techniques was meeting the other glampers. Some I’ve been following on IG or reading their blogs, others I’ve started following since attending. Gret and I were supposed to go again in June, but it’s just not going to work out for us to go again to the next one. I participated in my first swap. It was a First Crush (hello, Sweetwater, of course) swap for Valentine’s Day. I didn’t use a pattern for the mini, just kind of made it up as I went along. 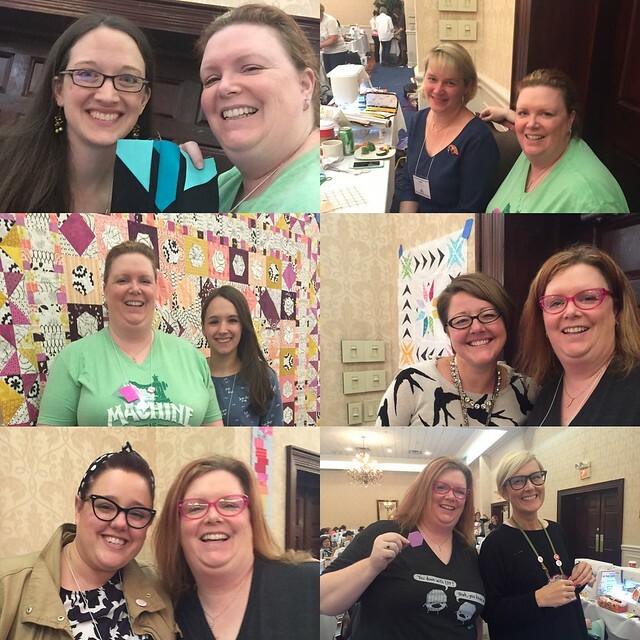 As one of the extras I sent her the zipper pouch – it was my first time making that particular one, and the first time I used EPP hexies in a finished project – I was rather proud of them (thanks again, Katy Jones!). I used this tutorial by Kristi at Obsessive Crafting Disorder for the zipper pouch. In late-November I ignored all my wifely and motherly duties and made this Wonder Woman mini over about 3 days. 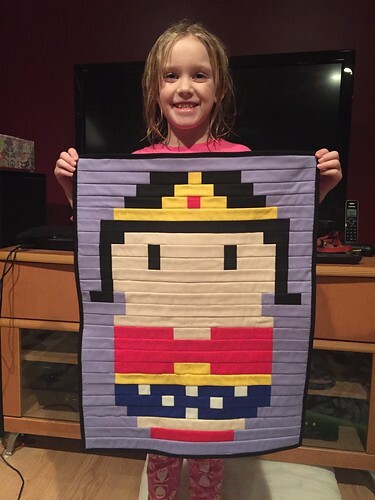 She was inspired by Jennifer’s Super Hero quilt for her nephew. When I saw that, I knew I had to make myself a Wonder Woman of my own. Modeled here by The Pink One, WW now hangs outside my cubicle at work. 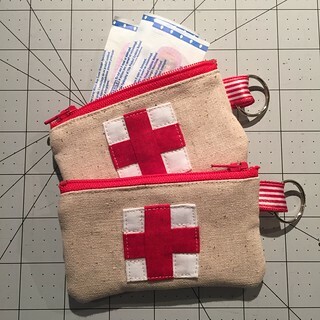 Last weekend I decided I was going to bust out these little bitty zipper pouches for 2 of my girlfriends. I was able to fit in a Neosporin-to-go and some bandaids, and that’s it, they’re so tiny! Those are 4″ zippers my friends! 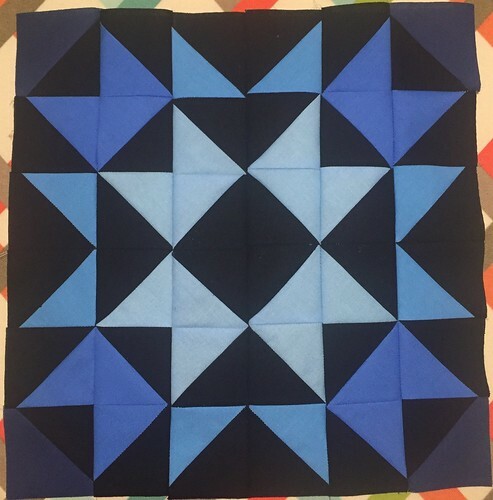 The white squares finished at 1/2″ each. Definitely the smallest squares I’ve sewn! 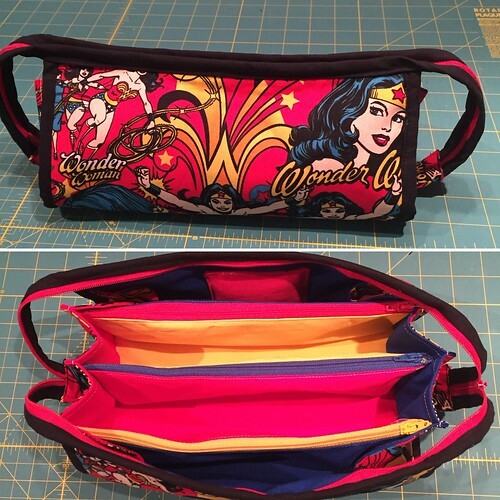 Because I hadn’t had enough zippers, I also made my first Sew Together Bag. Wonder Woman version, of course! The lighting was bad when I finally finished her up, but I’m pretty proud of how my first run at this bag turned out. I may make more for friends once I work up the nerve again! 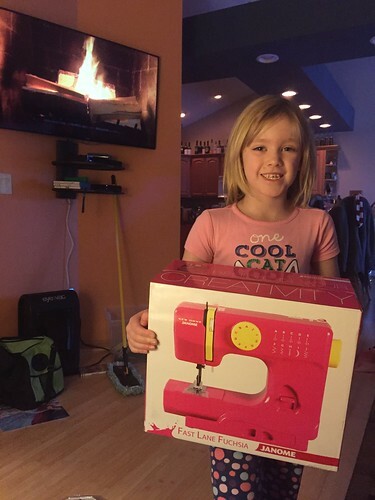 Santa brought The Pink One her very first sewing machine, and she was so excited to get started. Such concentration! 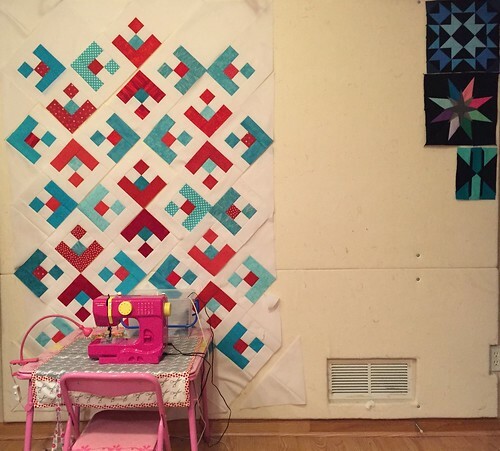 And finally…here’s what’s currently on my design wall – the Snowflake quilt from the We All Sew Quilt-along in October. I started it in December and I don’t have that far to go to finish the top. I’ve just got to set aside a few hours and get to it. So even though I’ve been MIA in this blogspace, I’ve still been making. I hope to be blogging more regularly again, but work is about to get crazy busy and I’ve got three trips in the next 7 weeks. Two for work, one for fun, but still a lot of being gone. 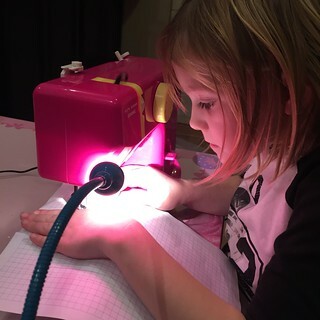 Add in there a weekend class with Sara of Sew Sweetness and it’s going to be a CRAZY two months! 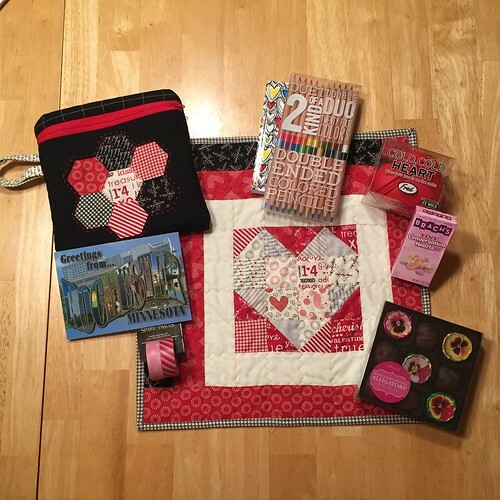 This entry was posted in Crafts, Family Stuff, Other Fun Stuff, Quilts and tagged Alison Glass, First Crush, Glamp Stitchalot, hexies, Jeni Baker, Katy Jones, Sarah Fielke, Sew Together Bag, Snowflake Quilt, Sweetwater fabric, Tula Pink, Violet Craft, Wonder Woman, zipper pouch. Bookmark the permalink. 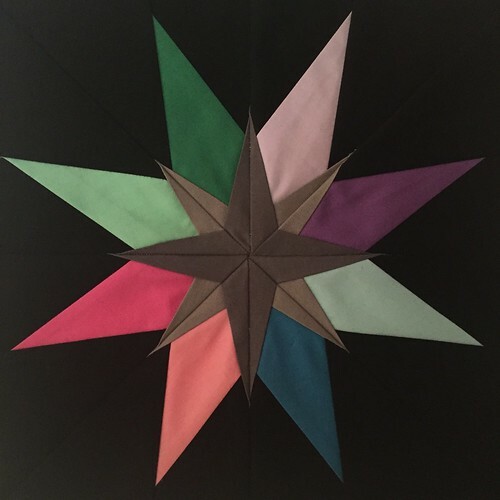 I love your Snowflake Quilt colours! They work so well together. 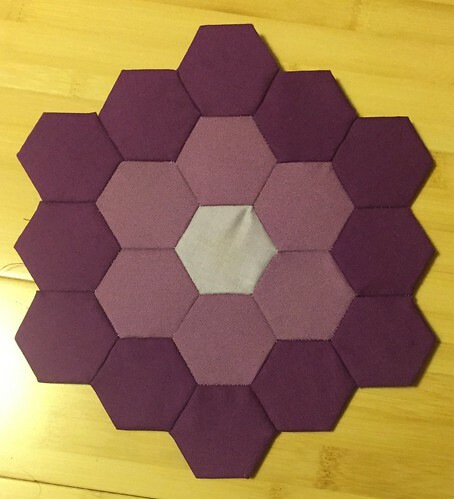 It looks like a fun quilt to make too, would you recommend it?